Register Log In Home Forums Passenger Car Motor Oil (PCMO) - Gasoline Vehicles Any analysis on the Mobil 1 0W-40 ESP Dexos 2? 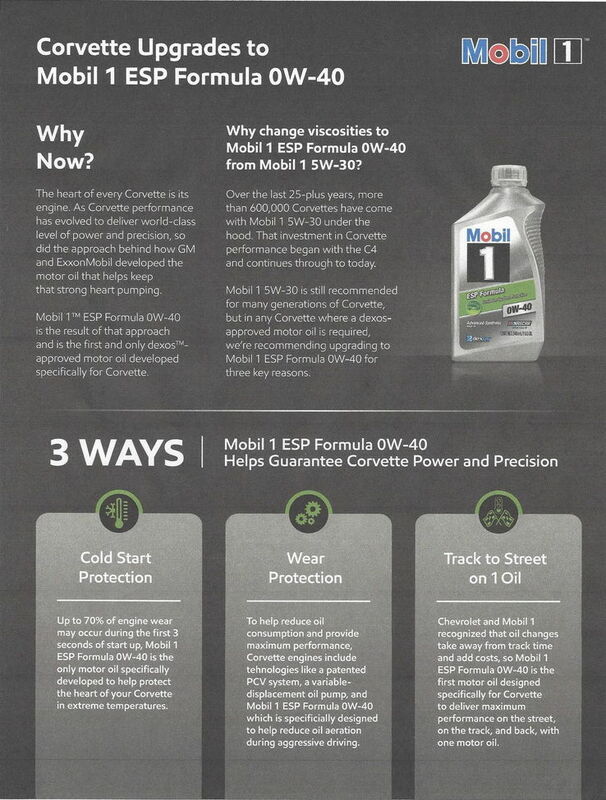 As some of you may be aware, just last year, GM changed their recommendation for Corvette & Camaro engine oil to the relatively new Mobil 1 0W-40 ESP Dexos 2 Not to be confused with the European formula, see image below. This Mobil1 OW40 Dexos 2 oil (Mobil 1 ESP Formula 0W-40) is also the recommended oil for all C7 Corvettes prior to 2019. This oil has been claimed to have many benefits including exceptional fast oil flow at startup along with low temperature pump-ability and exceptional viscosity/performance characteristics at high-temperature and high-RPM operating conditions. But how is it holding up over time? Can anyone point me to oil analysis from Camaro or Corvette guys? I'm your biggest fan, Ms Blake. .
You are in anti-Mobil forums-- don't expect unbiased opinions here. I don't think OP was asking for opinions. Why would anyone care about opinions? I'm with you-this is a SOPUS shill or a bot trolling here, there's been no overt XOM bias that I've seen. Looks Ok to me, though there is no comparison. However, I am still baffled by the fact that this oil has HTHS of 3.53, while previous version of Mobil1 ESP Formula 5W30 had 3.58. I still have 3 oil changes worth of 5w30 ESP Formula in my stash and Canadian Tire still has this oil on clearance (but people still haven't been buying it, I keep checking the stock online at all the stores near me) I will keep travelling to different stores to stock up. But Mobil1 "watered" down new ESP 5W30 too. I seriously do not understand why? It is not like going from 3.58cp to 3.5 in new ESP 5W30 will have any impact on mpg. So, I really do not get it unless this GTL is really not on par with previous VISOM base. I wouldn't assume it's watered down just by product data sheet numbers. If I owned a vehicle that called for or needed it I'd use it in a heartbeat. Gosh, only one UOA found, and it's back in October. I'm hoping to see more analysis when the Spring oil changes start for the performance car enthusiasts. Right, and there have been several GM engineers, some from Corvette Racing, that have said how much they have tested Mobil 1 on track and street.